You can study up to 144 items at the Hana Ami Blumenschule. All designs are reflecting the originality of Kazumasa Kubo and Gabriele Wagner-Kubo, from basic designs followed by traditional items and handicrafts, going to cultural items like Easter and Christmas, Strauss (handtied bouquet), Kranz (wreath), bridal bouquets, vegetative style arrangements (natural designs) and objects. The variation are for sure abundant. Having that many items means, that you can learn much longer and also teach much longer. "I want to know more, I want to be better". If these are your thoughts and wishes, the Hana Ami Blumenschule is meant for you! There are five items of Strauss in every course. Form designs have a clear outline, if it is round, triangular or square. You will study many variations. 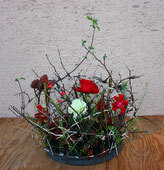 Learn how to devellop a natural design following the vegetative concept of nature itself. Creating awareness about the texture of a plant and integrating it into designs. 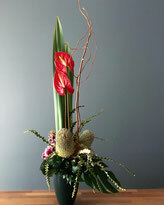 Expanding the width of flower design by incorporating a "skeleton", a "construction", into the floral world. 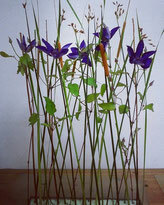 Designs focussing on shapes and lines, which can create a large space with few flowers, are an important basic training. You will study 2 bridal bouquets in each course. What effect will the angle have on the crossing designs? Crossing designs are so new to the design world! What is an object? Study and make an object called "The Giant Bulb", inspired by the works of Dali and Magritte! A brand new variety of works are born when you learn to arrange by degrees. Degrees of composition, degrees of movements and degrees of amounts. 4 Christmas items in each course, such as table wreathes, hanging wreathes, candle arrangement, lavender stars and very traditional German window displays for the festive season! 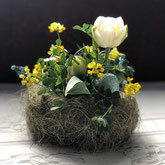 Studying the cultural background and the techniques of how to build nests and how to color Easter eggs, you can learn everything you need for popular Easter with our special "culture texts". 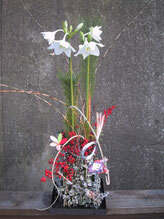 In the 2 upper courses, you will learn the original Japanese Blumenschule New Year designs! In the upper course, items based on the concept of era style are taught, such as the Flemish and Baroque style. In the highest-grade intensive course, you will get trained to make your own design. Listening to a story, evaluating your imagination, then transfer into a real design. The door into the designing world opens! we give freedom to our instructors! Freedom of flower choice: it is up to you, which flowers you use to teach an item. We recommended flowers, but your choice is free! Freedom of container choice: of course, we recommend containers, but again, it is your free choice which container you use for teaching. 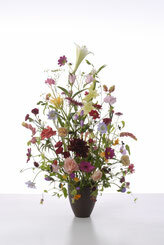 Freedom of size: you can teach the items in a very small scale, you can widen them up into gorgeous arrangements. The volume of your lesson items is your free decision. Freedom of pricing: our prices to you ( students diploma fees, text fees) are fixed, but your lesson price is your free decision. With this system, we are enjoying to see a wide collection of many varieties. And that is what makes flower design so enjoyable, right?